Dodgers activate Carl Crawford from disabled list, option Zach Lee to Triple-A. 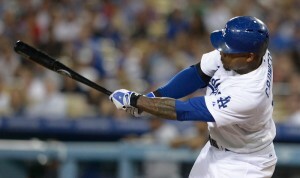 The Dodgers activated Carl Crawford from the 15-day disabled list on Tuesday. He’s starting in left field and batting seventh against the Miami Marlins, who will send right-handed pitcher Tom Koehler to the mound. Crawford has never faced Koehler in his career. Carl Crawford hits pause on his rehab. DENVER — Carl Crawford did not travel with Triple-A Oklahoma City to their road game in Iowa today. Instead, he’s flying back to California for a rehab game Sunday with Single-A Rancho Cucamonga. Crawford went 0-for-4 in his first game, and 3-for-4 with two doubles and two RBIs in his second. The Dodgers plan to activate him Monday for their series against the Miami Marlins. Crawford is on the 15-day disabled list with lower back soreness. Carl Crawford isn’t starting a game in Triple-A today after all. ATLANTA — Carl Crawford‘s minor league rehabilitation stint has been delayed by a travel issue. Crawford, who’s on the 15-day disabled list with a sore lower back, was supposed to be in the starting lineup for Triple-A Oklahoma City today. Carl Crawford has yet to arrive in OKC due to travel issues. Bill Haselman says he might be available to pinch hit, but unsure. Dodgers manager Dave Roberts said “there were some travel issues,” but declined to elaborate. Crawford was with the Dodgers in Atlanta on Monday and was scheduled to fly to Oklahoma City today. Crawford is eligible to be activated Sunday, when the Dodgers wrap up a three-game series against the Rockies in Denver.